Me and these date balls go way back. (Yes I’m aware that sounds painfully awkward). But, it’s true. These little treats were among the first things I made after deciding to go on a paleo diet over half a decade ago. They’re also the dish that I prepared when interviewing to become a Culinary Demo Specialist at Whole Foods Market around the same time. That job was the first step in a long and surprising journey that led me to the place I am today. If it weren’t for these seemingly inconsequential date balls, Anya’s Eats might never have existed. Okay, so maybe I’m being dramatic. But either way, this treat remains one of my all time favorites. If you’re invited to a potluck or are throwing a party at your house, this is a perfect dessert to prepare, especially if you don’t feel like baking. And even the pickiest of eaters love these. Personally, I love mine to be a little crunchy, but I know a lot of people don’t. 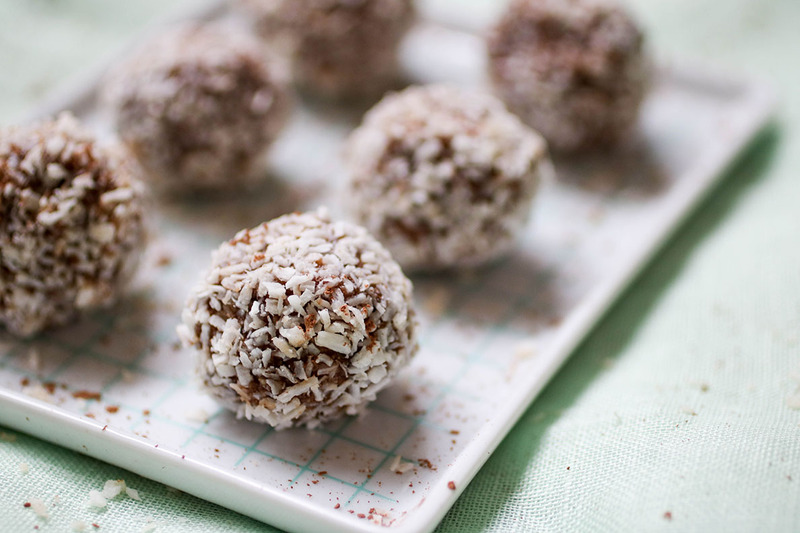 If you want a crunchier ball, instead of placing all of the ingredients into your food processor at once as the recipe states, simply add the almonds to the food processor first, grind until they are at your desired consistency and then set aside. Combine the other ingredients well and then add the nuts back in, pulsing a few times to make sure the mixture is well combined before rolling. Place pitted dates in a bowl of water and soak for 30 minutes. Place all ingredients into a standard sized food processor and mix until fully combined. Stop processing occasionally and scrape the sides to ensure equal blending. 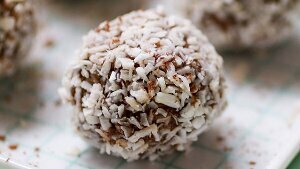 Once fully combined, roll mixture into 1 inch balls with your hand and roll in shredded coconut. Cool in the fridge & freezer and serve chilled for best flavor and texture. Thanks for sharing the awesome recipe! I was wondering if the coconut oil had to be in a liquid state or if it would work while still solid? Thanks! Hi Juliana! Ideally it would be in a liquid state so that it becomes fully mixed with the other ingredients, but it’s also likely it will heat up and soften in the food processor. even better with a tsp of peppermint extract! How Many Calories per ball ? I don’t calculate the nutritional facts, but you can plug the ingredients into something like my fitness pal and it will tell you!